My love of rhubarb is a long lasting one. I have early memories of sitting on top of the rabbit hutch, legs dangling and dipping freshly cut rhubarb into a cup of sugar… I wear these sweet and sour memories like a rhubarb coloured coat that feels really cosy. The two bunches of rhubarb below were picked at the same time – one from the forced plant and one from the traditional patch. 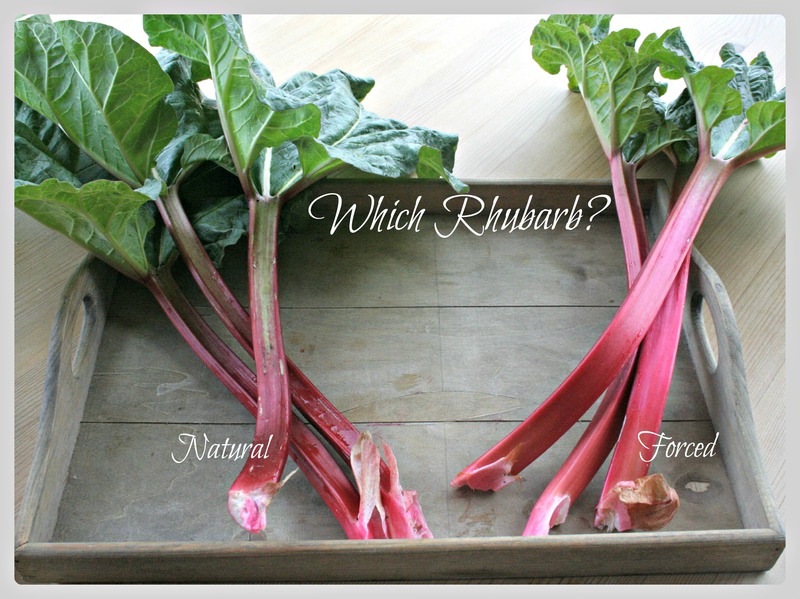 Rhubarb is easy to harvest as all you have to do is pull and twist the stalk at the base and it will neatly come away. From the photos you can see that the forced rhubarb has much smaller leaves but the stems are cleaner and more colourful being a beautiful pinky/red. I washed the rhubarb well, mouth watering and chopped it into bite size pieces and the taste test was completed when the rhubarb was raw. And the results? Well, the forced rhubarb was noticeably sweeter and had more of the rhubarb tang to it so I’d definitely recommend forcing it if you can. 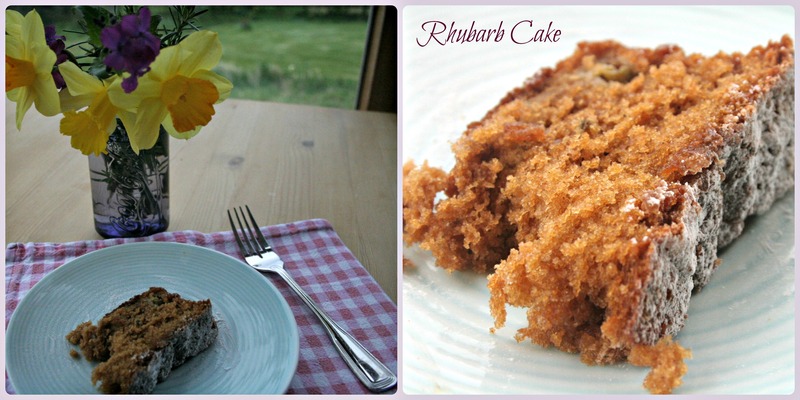 There’s so many things you can do with rhubarb – crumble, pie, cobbler, fools and cakes to mention a few. It is also good with strawberries to sweeten it and even with mackerel (although I have never tried this combo!). 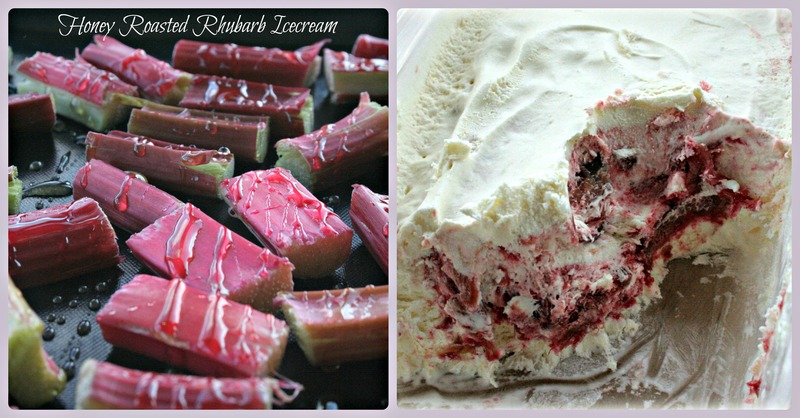 Rhubarb and custard are delightful together but I had a hankering for Rhubarb ice-cream. The recipe below is really simple, there’s no churning involved and I ate a quarter of the tub before remembering to take a photograph. Bear with me – I threw this together so feel free to experiment. Spread the freshly cut rhubarb onto a non stick sheet and drizzle in honey. Slow roast for 20 mins or so under soft and bubbling slightly. In the meantime whisk the cream into soft peaks (not too much) and stir in the sifted icing sugar (to suit taste). Once the roasted rhubarb has cooled fold in this gently into the cream mixture, pour into a suitable container and then into the freezer for a couple of hours. I like the rippled effect but if your mix it more thoroughly you’ll get a lovely pink coloured ice-cream! 1. Preheat oven to 325°F 2. Prepare 9×13 or 8×12 pan by spraying with cooking spray 3. Cream butter and brown sugar together in a large bowl 4. Add eggs and vanilla and stir 5. In a separate bowl, combine flour, soda, and salt 6. Alternately stir in the buttermilk and the flour mixture into the other ingredients 7. Fold in rhubarb 8. Pour into prepared pan 9. Combine sugar and cinnamon for topping and sprinkle on top of cake 10. Bake in 9×13 or 8×12 pan at 325°F for 40 minutes. The cake had the texture of carrot cake (rhubarb is a veg I suppose) and was especially nice on Day 2. It is really delicious warmed slightly and served with a portion of the rhubarb ice-cream… but that might be one stalk too far for all but the seasoned rhubarb muncher! !